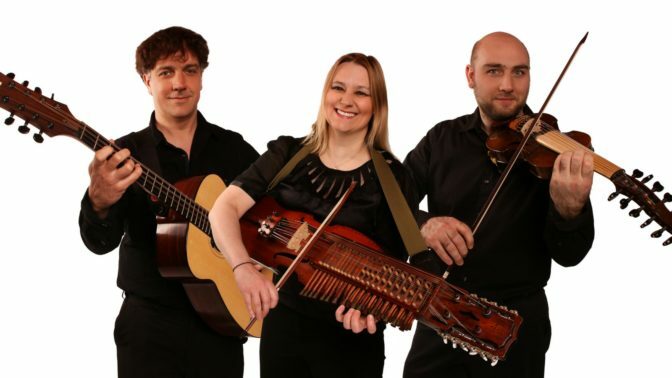 Led by caller Andrew Swaine with music from exciting new trio Purcell’s Polyphonic Party, the Halsway Playford Weekend promises to be stimulating and enjoyable! Aimed at dancers who want to learn more about the music and dances published by John Playford in the English Dancing Master in 1651 – where country dancing began, this is an intensive weekend of dancing, but there’s the option to take some free time on the Saturday afternoon. There will be a Ball on Saturday evening. Andrew Swaine combines deep knowledge and research into Playford (doing his own interpretations direct from the sources) with unfussy, patient and irreverent enthusiasm for making them fun. We’re delighted to welcome Purcell’s Polyphonic Party (John Dipper, Vicki Swan, Jonny Dyer) as our house band for the weekend; three exemplary musicians who have come together to combine their love of Purcell, Playford, Baroque and the Nordic Noir. With 99+ strings to their armoury of unusual instruments you can be assured that a dance evening has plenty of variety! This is an intensive weekend of dancing for regular dancers, but with the option of some free time on Saturday afternoon if you’re flagging! If you enjoy Playford dancing, want to understand more about its origins and put that into practice, then this course is for you. Andrew Swaine has been dancing from a young age, trying many styles and loving every minute of it. He began calling and teaching workshops upon joining his University Playford group The Round in 1996, and since then has worked with innumerable bands at clubs and festivals across the UK. In his teaching he hopes to pass on some of what attracted him to the dances, such as their great variety of speed, complexity, vigour, shape, etc – but most of all to have fun! When not calling he can be found indulging in other folkie pursuits, including as playing the accordion (and writing some tunes), Morris dancing, Molly dancing, and occasionally playing bass with the Cambridge-based ceilidh band Moon Carrot. A respected and established performer, composer, teacher and instrument maker, John grew up steeped in the traditions of Southern England. His unique playing style and compositions convey a deep understanding and passion for indigenous culture. John’s passion for vernacular music led to his degree dissertation focussing on the interpretation of field recordings, looking at intonation, tuning and expression. Vicki studied double bass at the Royal College of Music. She also plays various types of bagpipes, flute, recorder, piano and nyckelharpa (Swedish keyed-fiddle). On leaving music college Vicki started down the long path of folk music and was only seen on rare glimpses back in classical orchestras. You’ll find Vicki now inhabiting the troll ridden forests playing her Swedish bagpipes, bagging tunes for new books. Vicki holds the Zorn Bronze Award for the traditional playing of Swedish bagpipes and runs workshops and teaches the nyckelharpa around the UK. Jonny is a multi-instrumentalist, performer, writer and arranger. Classically trained as a pianist and trumpet player, he now specialises in traditional music from the British Isles and Scandinavia; primarily on spinet, accordion, guitar and cowhorn. By default, Jonny is probably England’s leading exponent of the Swedish Kohorn (cowhorn) and was just as surprised as you probably are to find out that forests have the most wonderful echoey acoustic to play the cowhorn in. Go and try it, it’s awesome!